This entry was posted in Issues and Ideas, Kannada & Karnataka, Media, Mysore-Bangalore and tagged AoL, Art of Living, Bhagwad Gita, Churumuri, P. Chidambaram, Sans Serif, Shloka, Sri Sri Ravi Shankar, SSRS, The Times of India. Bookmark the permalink. The art of living is a fully commercialized conglomerate of the rich and the mighty headed by this so called guru.there is nothing spiritual about it.Infact I had learnt their sudarshan kriya a few years ago which is nothing but a few pranamaya exercises which he claims to have invented it. They offer different levels of meditation courses all for a hefty sum all beyond the reach of a common poor man .I have yet to come across instances of these members during natural calamities like the north karnataka floods helping out the victims.On the contrary ,they sense where to make a killing as in the case of mangalore crash offering counselling to the relatives instead of volunteering in rescue and relief operations.As regards their contribution towards charity and social causes,a miniscule amount from the billionaire-guru’s wealth would have been spent. TOI’s advice seems a bit facetious… How could Mr. Chidambaram be “improperly briefed” when he was ideologically briefed? SSR resorted to black lies to cover the white lies… So, what we were left with were neutral facts. 1. The shot was fired within the premises which is supposed to be about peace, positive energy and the center of ‘art of living’… Someone wanted to depart lessons in art of dying..
2. Ravishankar lost it. All his teachings were for others, when he was under stress, he behaved like anyone else. 3. SSR is a great spiritual entrepreneur who knows any news is good news. He knows how to gain publicity at free cost. He knows it’ll lead to more business..
4. Our police are dumb asses. They never catch anyone for anything! For Ravishankar, publicity for himself is the oxygen that has helped him to survive and grow. Company of the rich, famous and the powerful has helped him enormously. 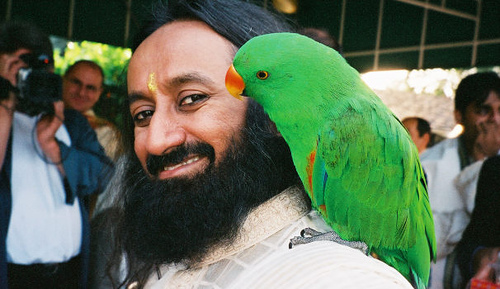 He has been visiting various trouble spots in India and even Sri Lanka, touting himself as the messenger of peace. The status symbol of ‘Z’ security cover for which you and I pay for, has been the goal of the man. The great sage Ramana Maharshi communiated through silence. Ravishankar should take a leaf out of that great sage’s life and make an effort to practice it. I hope the incident of a bullet that fell like a damp squib in the ashram, will prove his activities to be another damp squib. As between Ravi Shankar and the DGP Dr.Ajay Kumar Singh, one of them is telling a lie…….and people know that it is not Dr.Singh! Pathanjali gave the gift of yoga and prayanama to mankind over 5000 years ago. Ravishankar is perpetrating a fraud on the gullible when he claims that the Sudharshan kriya is what he has invented and has (if reports are to be believed), patented. His claims of innovations effected in the practice of yoga, is no different from the Abassador car manufacturers a few decades ago, who shamelessly called the same old car but with a different shape of side blinkers, as a new car model! The art of living’ in luxury and capitalizing on the ignorant is nothing but a giant marketing scam and massive money laundering institution that has some of the richest black-money pots and corrupt politicians as its well wishers! Truth is the bullet almost found its target. Have been enjoying your posts on Sri Sri. Simply Superb.